How Much Fruit Should You Eat Every Day? Eating a balanced diet means incorporating lean proteins, good complex carbs, an abundance of veggies, and the natural sweetness of fruit to your meals. 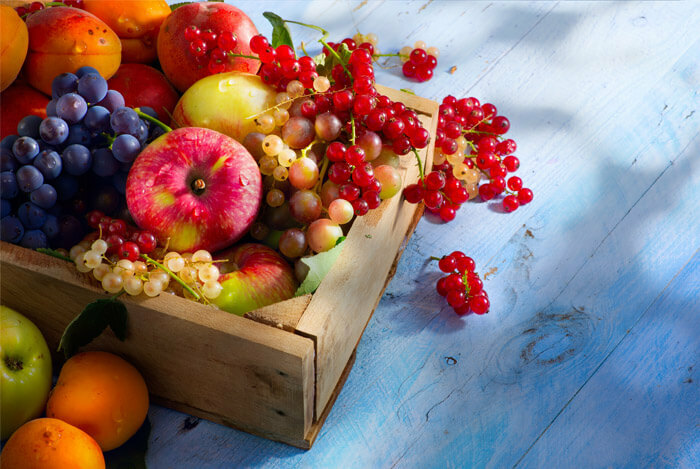 Fruit, aka nature’s candy, makes up one of the healthiest and most delicious food groups. It’s one of the first swaps I tell my clients to make when they’re trying to regulate excess sugar in their diets. Fruit brings more to the table than what refined sugar offers up. 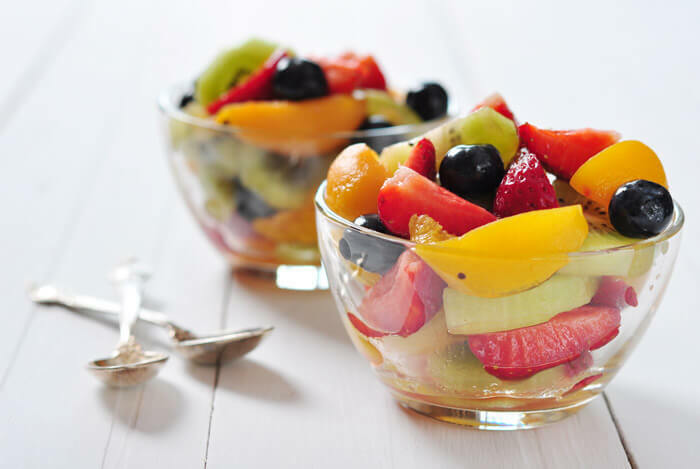 All fruit is low in calories and sodium, packed with fiber, vitamins, and nutrients. That’s reason enough to start loading up on fruit! So if fruit really is this amazing, can we ever eat too much of it? Are there any downsides to eating too much fruit? So What’s So Bad About Fruit?! Do You Know What A Serving Size of Fruit Looks Like? Fruit is packed with potassium, vitamin C, phytochemicals, and folate to help lower blood pressure, keep our immune systems healthy, and even keep cancer away. One of my favorite reasons for loading up on fruit (besides satisfying my sweet tooth) is dietary fiber. Did you know that the average adult only gets 15 g of fiber every day, despite us needing between 21-38 g of daily fiber? You’ll enjoy the most fiber when you eat your fruit with the skins on. If fruit is as great as I’ve been praising, can we gorge on fruit baskets? Sugar comes in several forms such as glucose, sucrose, and fructose. Sucrose, well, that’s just regular old table sugar. It’s a combination of glucose and fructose. Glucose is what our body uses as fuel. This source of energy powers everything from the cells in our organs to our muscles and our working brains. We typically get glucose from breaking down carbs. “Simple carbohydrates are broken down quickly by the body to be used as energy. Simple carbohydrates are found naturally in foods such as fruits…They are also found in processed and refined sugars such as candy, table sugar, syrups and soft drinks”. Both glucose and sucrose get metabolized in our bloodstreams. When glucose and sucrose are broken down and digested, they’re processed quickly and either used as fuel or stored as glycogen. You may have heard that because fruit is high in sugar and fructose, this means you shouldn’t eat it. That’s completely wrong. You’d have to eat an absurd amount of fruit for it to actually cause problems, even if you’re overweight. 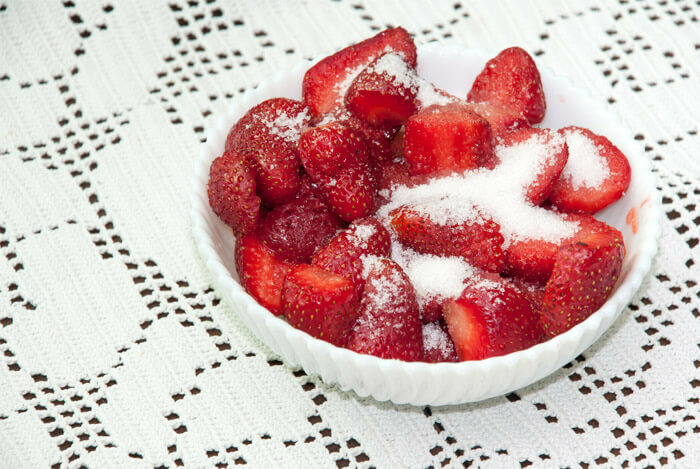 It’s just not possible to eat enough sugar from fruit to hurt your body. That said, fruit isn’t zero calories. If you’re eating too many total calories, and too much fruit, you can still gain weight. Your daily fruit requirement is actually pretty low in my opinion, coming in at 1.5 to 2 cups of fruit per day depending on your gender. But if you work out more, you can definitely up your fruit intake and stay well within your calorie and carb goals. It’s easy to keep track of your fruit servings if you cut up your fruit and measure it out, but most of us don’t have time to do that every morning so we run out the door with a banana under one arm. So what does one cup of fruit look like? If you follow these guidelines, you could eat one banana in your morning overnight oats and one medium pear after lunch and be completely done with your two cup fruit requirement. That’s almost too easy. The USDA says yes; one cup of fruit juice counts the same as one cup of fresh fruit. But I have to disagree here (cue gasp). 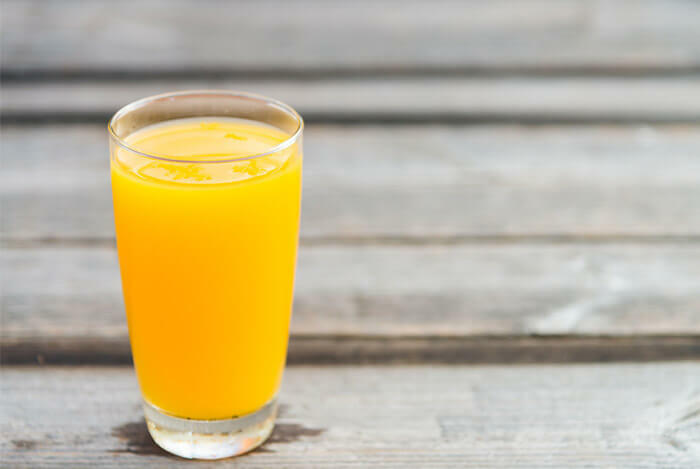 Fruit juice can have just as much sugar as what’s found in popular sodas. For example, Minute Maid 100% apple juice has a whopping 65.8 g of fructose per liter. Want to know what’s in Pepsi and Coca Cola? Both of them come in at lower fructose levels of 65.7 g and 62.5 g of fructose per liter, respectively. A serving of fruit is not only far lower in calories than a glass of juice, it also has more fiber which makes it harder to overeat. Be wary of juice labeled as “No sugar added”. 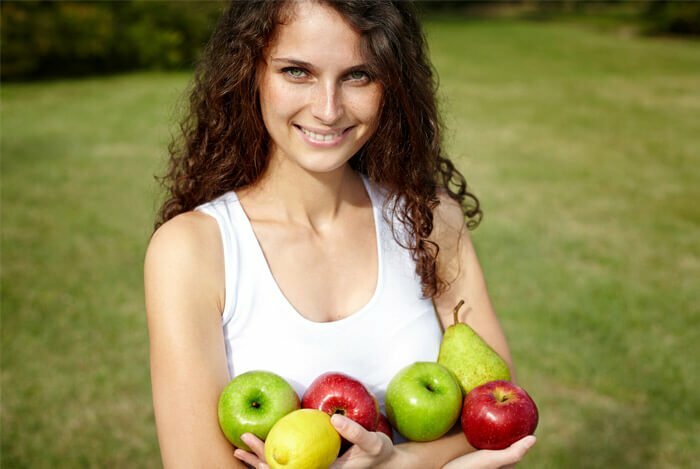 Even though the sugar may come directly from the fruit, it’s a super concentrated amount, devoid of the fiber found naturally in whole fruits. Chances are you’re already paying attention to the sugars and carbs in your food if you’re prediabetic or suffering from type 2 diabetes. You can use both the glycemic index and the glycemic load measurements to add the least blood-sugar-spiking foods to your fruit-filled life as long as you swap out some other carbs. The glycemic index measures how much the carbs in food affect blood sugar levels. 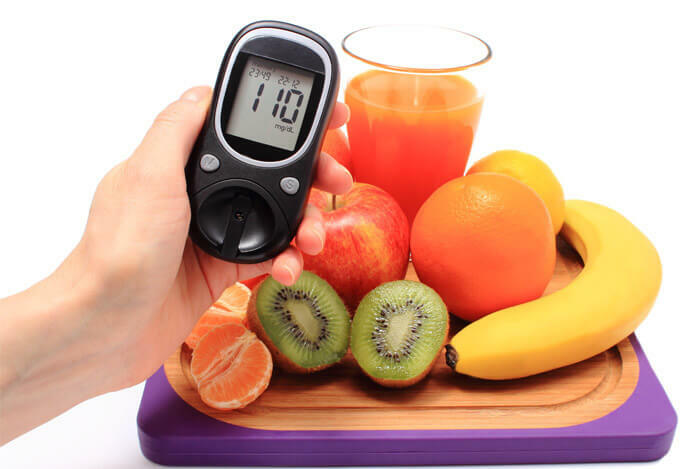 Foods with high GI scores (GI 70+) raise your blood sugar levels and foods with low GI scores (GI 55 or lower) will keep your blood sugar relatively stable. The glycemic load is a measurement that uses the glycemic index to calculate the amount of carb-based sugar in a single serving. A score under 11 is very low, anything over 20 is considered high in sugar. So for example, watermelon is a 72 on the glycemic index, which is pretty high. However, there’s only 5 g of carbs in a typical serving size of watermelon. After calculating the glycemic load, watermelon comes in at a very low 3.6. Using both of these measurements will give you an idea of which fruits to choose over others. Just keep in mind that you still have to count the carbs in fruit. If the statistics are to be believed, most of us aren’t eating enough fruit even though the recommended daily intake requirement is so low. Now if you’re throwing handfuls of fruit into your blender with reckless abandon, snacking on super sweet dried fruits all day, and eating banana splits every night, you’re going to be in trouble. What’s your take on fruit? Have anything else you’d like to share? Let me know in the comments below!